Video poker is a game of skills and as such, the outcome of every hand can be influenced with the right amount of knowledge. This is the reason why throughout the years a number of strategies have emerged, each one aiming at providing players with the best possible move in a particular situation. Nowadays, there are many available strategies which are based on one fundamental principle, however, they differ in terms of level of difficulty. Depending on how complicated these strategies are, they can be basic, intermediate or advanced. This diversity gives both experienced and inexperienced players the chance to improve their game. In this sense, the intermediate strategy is suitable for players who are fully acquainted with the basic strategy as well as the fundamental winning combinations. It is also advisable to be familiar with the most popular variations in order to be able to recognize them and alter the chosen strategy accordingly. When it comes to video poker, players should try and gather as much information as possible before playing in order to be able to reduce the house edge and become consistent winners in the course of time. The intermediate strategy is a bit more complicated in comparison to the basic strategy. However, it has also proven to be more efficient and accurate which definitely makes it worth a try. Even though it is more complicated, it is worth mentioning that most players find it easier to learn it as they are already familiar with the basic strategy and its fundamental principles. The intermediate strategy uses the same basis as the rest of the most popular methods – it suggests the best move, depending on the particular hand. It is the perfect option for avid players who want to take their gaming skills to the next level and improve their game. Thanks to it, the choice whether to hold or replace a certain card is no longer difficult. However, it should be noted that the intermediate strategy doesn’t guarantee a definitive win all the time as besides a reliable strategy, players should also have luck. Its main purpose is to decrease the house edge as much as possible and improve players’ chances of winning. The intermediate strategy is used by a number of gamblers worldwide who wish to make the most of every game. However, another reason why this strategy gained in popularity so much is that it also offers them the chance to make a profit in the long term. As already mentioned, the intermediate strategy suggests the best move, depending on the particular hand. What makes it different from the rest of the developed strategies for video poker, is the fact that is moderately easy to be learned. The following chart takes into account the cards in players’ hand and according to them, it recommends the best way to cope with the situation. It illustrates the most common situations that will inevitably occur at some point during the game which makes it extremely useful and reliable. For instance, if players are dealt three cards to Royal Flush, then it is best to break up an open-ended Straight to draw two cards. If four of the cards in their hand are high cards – Ace, Jack, King and Queen, players should break up only on the condition that the Jack and the Queen are of the same suit. In case they have three high cards, that are not of the same suit and among which there is an Ace, then it is best to discard the Ace. The reason for this move is that this way players have much better chances of forming Three of a Kind or Four of a Kind. If applied correctly, the intermediate strategy can be a great guide for all types of players as it will help them significantly increase their chances of winning. Thanks to it, they will be able to easily decide which cards are worth keeping and which ones should be replaced. Even though it is possible to find a number of variations of the intermediate strategy chart, all of them operate on the same principle. It is very easy to take advantage of it as all that it takes is to simply compare the card combinations with the chart. Players should take their time to consider every possible winning combination that can be formed in order to be prepared to act accordingly, regardless of the five cards they will get. Once they get familiar with the chart, applying the intermediate strategy becomes moderately simple. Since the online casinos have become one of the major sources of entertainment in numerous countries all over the world, it is possible to enjoy most popular casino games, including video poker, without having to go to a brick and mortar casino. When it comes to video poker, playing online can be extremely beneficial as this way, players can have a look at the chart of their chosen strategy at any time. After some practise, they will be able to recall it, when needed, without even trying. Online casinos offer many opportunities that brick and mortar casinos don’t provide which is one of the reasons why they appeal to such a huge number of gamblers globally. 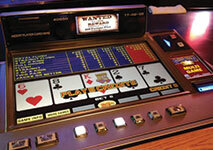 It is also possible to play a number of video poker versions online and experience the game in a very different new way. However, make sure to always get familiar with their rules beforehand and alter the intermediate strategy accordingly in order to be able to apply it correctly. Another alternative way to remember the chart is to keep it on a visible place at home as this way, players will be able to memorize it without putting any efforts and time. 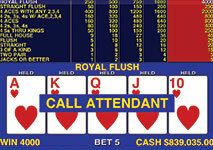 Players who don’t play video poker on a regular basis can use some of the available strategy cards. It is also really important to pay special attention to the card combinations that are similar in nature and make sure to be able to tell them apart. Players should also keep in mind that whenever they want to try a new exciting variation of video poker, they need to consider the additional rules first and then, alter the strategy accordingly. This doesn’t mean that a new strategy is needed each time they play video poker different from the classic game, but simply that the suggested moves should be reviewed. For instance, some moves may become irrelevant as the variation might not include the particular winning combination. It is always best to adapt it to the particular version in order to be able to hold the best cards and form a winning combination. In general, players should stick to the intermediate strategy throughout the whole game and play according to it. This is the best way to assure the desired result and to decrease the house edge. Video poker is undoubtedly one of the most exciting casino games of all time which is played by a number of players worldwide. It is a game of both skills and luck and therefore, it is possible to make an impact on the final result by using an appropriate strategy. The intermediate strategy gives players the great opportunity to reduce the house edge significantly and increase their chances of winning in the long term. Its chart illustrates which card combinations are considered worth keeping in particular situations. It provides players with the most valuable information of when and which cards to replace.